A few years back, I found this ad where there’s an image of a cup of coffee about to spill on a laptop. That photo haunted me so much that until this day, I make it a point that my drink is far enough to damage my laptop. I thought I was able to escape that catastrophe but no ho ho ho…. 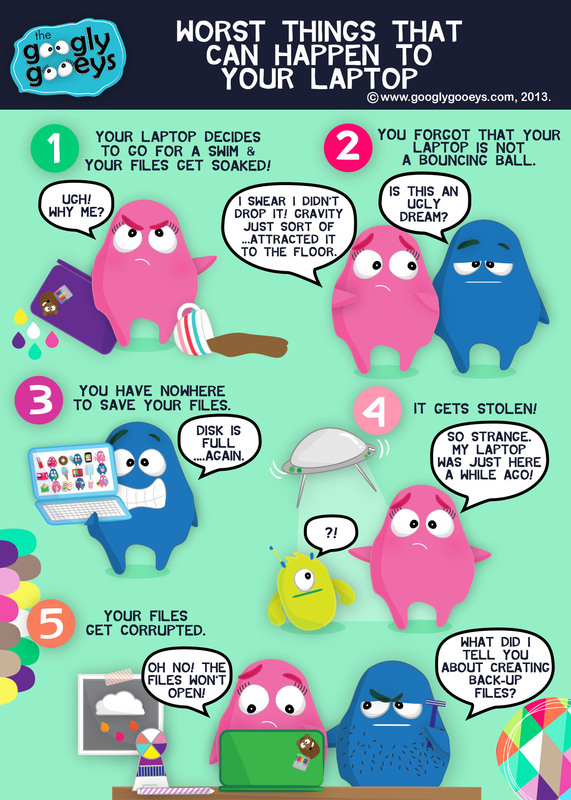 : Before I graduated from college, my laptop got stolen. A few months before that, I stumbled upon this TV show where the guy was explaining how you’re supposed to have multiple back-ups for your computer files. I thought that was just simply bizarre. The next day, the blue screen of death greeted me early in the morning. Ah, so much for digital karma! If that wasn’t enough, just a couple of years back, I was fixing my workspace & forgot that my laptop was still plugged. I pulled another cord towards me not knowing that it was intertwined with my laptop’s cord. Next thing I knew I heard an ugly sound saw my laptop on the floor. Well, you’ve pretty much guessed that after a series of unfortunate events, I finally learned my lessonssss! We now have multiple external hard drives at home & I have a monthly alarm prompting me to backup my files. 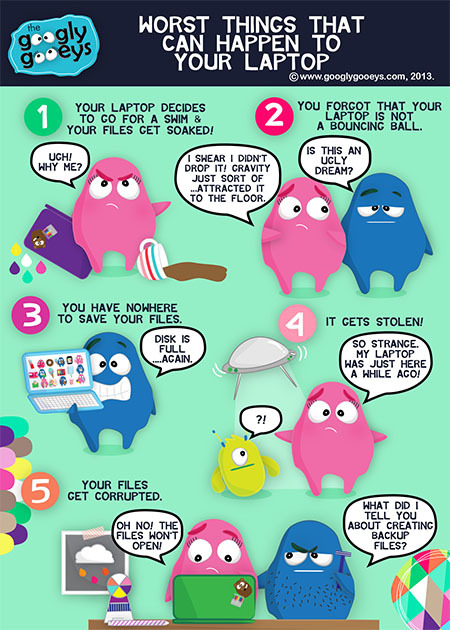 Ponggo works with a lot of photos & videos while I always need to back-up my artwork files, photos & the whole Googly Gooey folder! 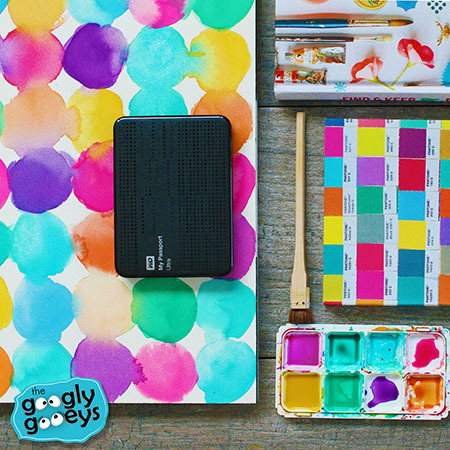 Above: Workplace essentials: Watercolor paper, a book for inspiration, a notebook, a brush, watercolor palette and a Western Digital My Passport® Ultra 1TB external hard drive for all my photos & artworks! Yes, I do have a schedule for my monthly back-up but I’m not that faithful to the sched mainly because all our external hard drives are bulky. It’s hard to bring them around. Also, they all need an external power source plus it takes a long time to transfer the files so you really have to be at home or at the office when you need to transfer & search for files. So, when I first held the Western Digital My Passport® Ultra 1TB & 2TB external hard drives, I can’t believe that they’re actually smaller than my first ever 256GB external hard drive from years back. They don’t have a fancy fan, a clunky adaptor, nor a stand because it’s so light and tiny! 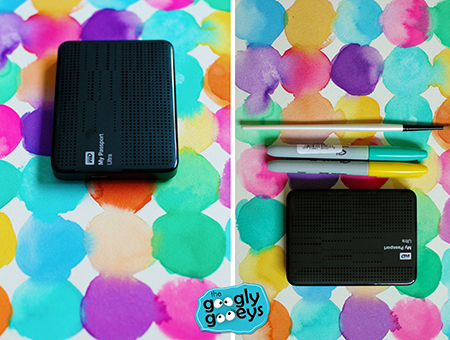 Above: Western Digital My Passport® Ultra 1TB. It’s smaller than my notebook! Definitely shorter than a Sharpie! I would always see fancy hard drives in computer stores but they can only hold as much data. As I’m typing this, I’m preparing to transition to a new laptop because this one is about to give up on me. I’ve been backing up my files and I thought it would take up most of my productive hours but apparently, this external hard drive, as explained to me by Ponggo, runs on USB 3.0 technology which makes the file transfer really quick & easy. It would be great though if someday, drives like these would have 3 ports: the thunderbolt, firewire 800 & the USB 3.0. (That was Ponggo taking over my blog post!). Anyway, this also comes in 500GB, 1TB & 2TB (Ponggo already owned the 2TB even before I could shout dibs! Hmp!). They also have these hard drives in blue, red & gray but I chose black because I love how it easily blends well together with the other colors. Our mobile phones and laptops have passwords & locks plus a cloud backup system. 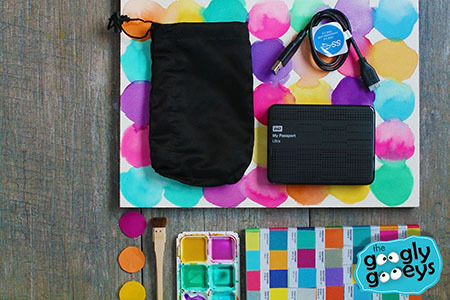 The Western Digital My Passport® Ultra also comes with an encryption and a cloud backup software! Yes, your backup needs a backup. This time, I won’t laugh at this statement because I don’t want karma to visit me again. Whoever said you can’t buy peace of mind? First of all, My Passport® Ultra portable hard drives are protected by a 3-year limited warranty (which from my point of view is not really limited as most of the gadgets these days come with only 1-2 year warranties) and are available at select retailers and distributed by EA Global Supply Chain Solutions, Inc. and Axis Global Technologies Inc. You can find it in the market for roughly: PHP 3,390 for the My Passport Ultra 500 GB; PHP 4,290 for the 1 TB is and PHP 7,290 for the 2 TB. P.S. Well, it wasn’t called “Passport” for nothing! 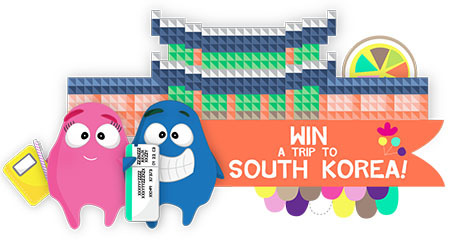 For every purchase of WD My Passport® Ultra, you get a chance to win two (2) tickets to South Korea! Promo runs from November 6 to January 15, 2014. Now, you know what to give your loved ones for Christmas! 😉 *hint hint, cough cough, wink wink* Click here for more details!